The 'Hounds chased the Riders all night long, only to come up short by a run, 9-8, in a wild game on a windy night at Rocky Town. Frisco built leads of 4-0 and 9-3 and the RockHounds charged back both times, slicing the deficit to 4-3 in the second inning and 9-8 after eight innings. The 'Hounds then had two men on in the ninth before reliever Locke St. John closed the door. Frisco, the Texas League's hottest club (see below), extended its win streak to seven games and is in first place in the early going of the South Division race. The clubs totaled 17 runs on 27 hits (the 'Hounds out-hit the Riders, 15-12) and twice combined to score seven runs in one inning. Frisco scored four in the top of the second and the RockHounds came back with three in the home half of the inning on an RBI double from Edwin Diaz and a two-run triple to straightaway center from Kevin Merrell (see below). The Riders added a single run in the third and four more in the top of the sixth, two of those on Charles Leblanc's two-run triple (Frisco's only multi-RBI at bat). The 'Hounds countered with three in the last of the sixth and drew within 9-8 with a two-run eighth that included Diaz's first home run of the season but scored only one run with the bases loaded and one out after Diaz's drive. 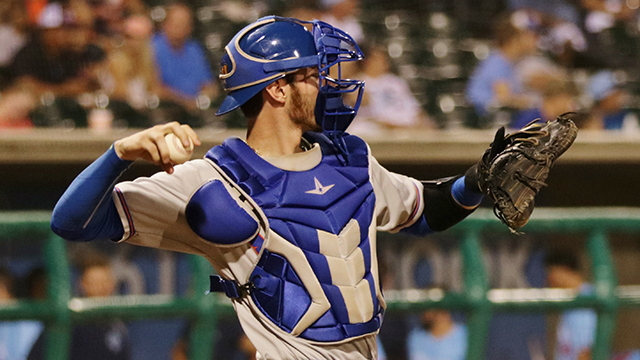 Frisco is now 7-1, the Texas League's best record, while the 'Hounds fell to 3-5. The clubs also have a game "pending" ... last Sunday's contest at Frisco was suspended due to rain with the 'Hounds leading, 4-1 (and still batting), in the 11th. The four-game series between the 'Hounds and RoughRiders continues Saturday night at Security Bank Ballpark with first pitch at 7:00 and postgame fireworks. Friday's start time was pushed up by thirty minutes with the forecast calling for wind and rain in the evening. The "call" to move the game up was perfect - - the wind was strong much of the game and the rain started less than thirty minutes after the final out. Frisco finished the game 8-for-12 with runners in scoring position, while the 'Hounds were 5-for-16 in those situations. Dairon Blanco, Edwin Diaz, and Kevin Merrell had three hits each for the RockHounds. - Merrell entered the game 3-for-29 and doubled his season output. His two-run triple in the second traveled 400 feet. - Diaz entered the game 4-for-23 and come through with a double and a solo home run in his three-hit night. - Jonah Heim (two doubles) and Greg Deichmann added two hits each. Luis Barrera (right shoulder) missed his fourth straight game Luis is 9-for-21 (.429) through the season's first five games, with two triples, a home run and four runs batted in.